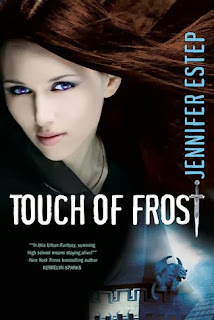 Title: A Touch Of Frost. In a nut shell: This wasn't a bad book, it was ok. It wasn't what i was expecting, i hoped for more, and i thought it would be all about her and her magic, and some crazy mythological plot, when really it wasn't like that all, and i was a little bit disappointed. The characters: I liked the characters, they were a little awkward at times, and occasionally i wanted to jump in to the book and tell them to quit being so weird, but overall, the characters were believable. The plot; I was confused. Is this a romance, or a mystery? I couldn't see past all the teen drama going on, and how much the character reminded us her mum is dead and her name. The plot however, is original. Its good, fresh, and a good combination between mystery and crime and teen lit, which is a hard balance to do, I think Estep did a good job with that! So i was confused, annoyed, entertained by this book. I see nothing wrong with it, i actually think its a good book, and i can;t wait to get my hands on the sequel. Spoilers:Gwen Frost, goes to a school for magical beings and warriors. But when the most popular girl in the school, Jasmine Ashton is murdered, Gwen sets out to find out who did it! On her mission she falls for the deadliest and hottest guy in the school Logan Quinn, but when he tries to kiss her she can't let him because if she does she's see his memories, and she doesn't want to see the memories of a guy who's slept with every girl in the school. Notes: This is not for young readers- a lot of very sexual themes.